Kebab (also kebap or kabab) is a Middle Eastern dish of pieces of meat, fish, or vegetables roasted or grilled on a skewer or spit. Originating in the Middle East, it was later adopted in Central Asia and by the regions of the former Mongol Empire and later Ottoman Empire, before spreading worldwide. In American English, kebab with no qualification refers to shish kebab (Turkish: şiş kebap) cooked on a skewer, whereas in Europe it mainly refers to doner kebab, sliced meat served in a pita bread. 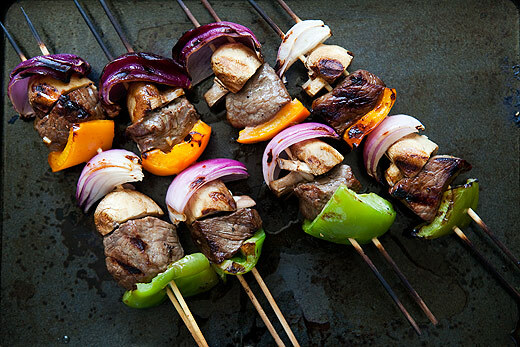 Tip from the author of the recipe, Elise Bauer: Using bamboo or wooden skewers instead of metal will help keep the steak from getting overcooked on the inside. Metal transfers heat, so is useful to use for chicken, or a meat that you want to cook all the way through, but not so useful for steak that you want done rare or medium rare. Like the sound of that marinade. Thanks for your comment Annie, I think our Ralph is turning into a Master Chef.